Ministry of Foreign Affairs issues strong rebuke of article highlighting a US$80,000 payment from Singapore-based Pereira International to Las Vegas firm R&R Partners for "consulting and lobbying services". 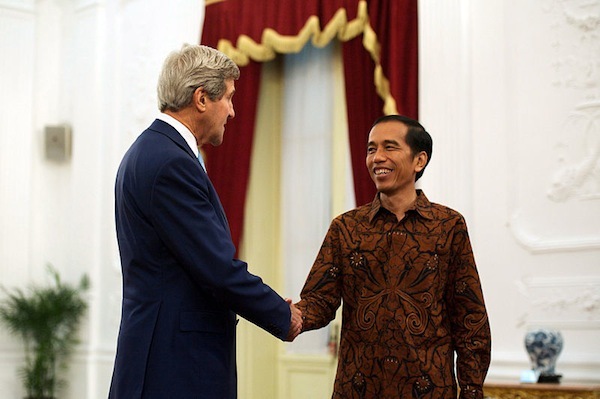 Indonesia’s foreign ministry has robustly rejected claims that it employed lobbying agencies or used taxpayers’ money to do so in the run-up to president Joko Widodo’s state visit to the US last month. "Just like other visits by the president, preparation for the US visit was led by the Minister for Foreign Affairs, in coordination with other ministries, agencies, parliaments, the Indonesian embassy in Washington DC, the Indonesian consulate general in San Francisco, the US embassy in Jakarta as well as the business community and other stakeholders," the ministry statement said. "This intensive preparation has enabled the signing of over 18 business deals worth over US$20 billion and a number of (agreements) between the US and Indonesia." The strong denial is in response to an article published by New Mandala last week written by professor Michael Buehler, lecturer in Southeast Asian politics at the School of Oriental & African Studies in London. In his article, Buehler highlights a filing with the US Department of Justice under the Foreign Agents Registration Act by Singapore-based public affairs firm Pereira International, in which it contracts the services of Las Vegas-based R&R Partners. According to the filing, R&R was "retained as a consultant by the executive branch of the Indonesian government". Among the firm’s duties was "arranging and attending meetings with key policymakers and members of the Congress and the executive branch including the Department of State," according to the filing. This was in addition to "attempt[ing] to secure opportunity to address joint session of Congress during Indonesian president Widodo's visit to the US; and identify and work with influential individuals, media, public and private organisations and affiliates in the US to support efforts of president Widodo." The contract states the cost of R&R’s services as US$80,000, to be paid over four instalments between June and September. While stating that there is no evidence of the foreign ministry hiring or instructing Pereira International to pay R&R for the lobbying services, Buehler said there are "clear links" between Derwin Pereira, head of Pereira International, and the Indonesian government. Speaking to Asia One, Buehler said the ministry "corroborates my story that this consultant Pereira was hired without the knowledge of the Ministry of Foreign Affairs". A former Straits Times journalist, Pereira was Indonesia bureau chief and "has a track record of lobbying for Indonesian elites," wrote Buehler. Pereira, whose firm specialises in public affairs and claims "close contact with senior government officials" did not respond to a request for comment from PRWeek Asia. Buehler suggested the contract could be indicative of fault lines within president Widodo’s government, particularly between the foreign ministry and the president’s chief of staff, Luhut Panjaitan, although he again states there is no evidence of Panjaitan hiring Pereira International. Buehler further questioned why a US PR firm was hired with "taxpayer money for work the Indonesian embassy could have done," prompting the sharp rebuke from the foreign ministry.